Sweetzels® is a household name in Philadelphia. Mention warm apple cider, a glowing fire, or pumpkin picking on the farm, and you’ll have any East Coast native craving a box of our original Spiced Wafers. Family owned and operated Sweetzels has been baking and packaging all of our products in the United States for over 100 years. OUR COMMITMENT TO THIS TRADITION, AND TO THE QUALITY OF OUR ALL-NATURAL SPICES AND FLAVORINGS, HAS KEPT OUR CUSTOMERS COMING BACK SINCE 1910. While all of our products are baked and packaged in the U.S., we outsource the finest spices and flavorings from all around the world— because, let’s face it, the best cinnamon comes from Saigon. 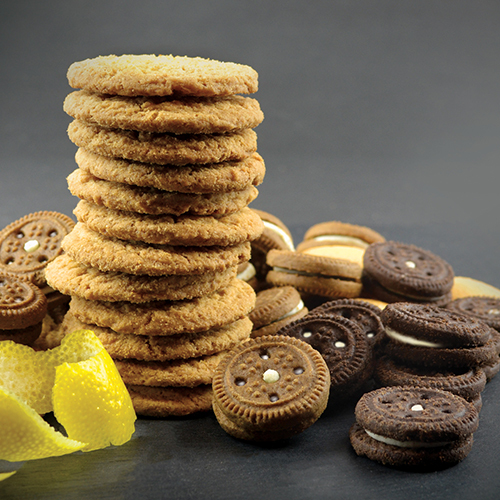 OUR LEMON SNAPS ARE MADE WITH REAL LEMON OIL AND OUR GINGER SNAPS WITH REAL COCHIN GINGER AND BLACKSTRAP MOLASSES. Many years have passed since the original Spiced Wafer first warmed the hearts of our customers. The Sweetzels® product line has since expanded to make room for new and exciting flavors—Ginger Snaps, Lemon Snaps, Chocolate Mini Crémes, Spiced Mini Crémes— a taste for every palette, from Philadelphia to your home!